The Hinshaw BIPA legal team defends clients against the rising tide of Illinois biometric data privacy class actions. Biometric technology is becoming commonplace in the workplace as a result of increased accessibility and affordability of this technology. The Illinois Biometric Information Privacy Act ("BIPA") was established over a decade ago, but a recent Illinois Supreme Court decision has brought on a new wave of class action lawsuits which allege BIPA violations. These suits can expose a company to substantial financial liabilities. As a leading consumer class action defense firm in Illinois and nationally, Hinshaw is at the forefront of defending against this rising tide of BIPA-related litigation. Clients are turning to us because of our unmatched track record in successfully defending statutory-based consumer class action lawsuits at trial and on appeal. In addition to representing employers and insureds in numerous BIPA disputes, we have successfully handled hundreds of cases involving the Telephone Consumer Protection Act (TCPA), Fair Debt Collection Practices Act (FDCPA), and the Illinois Collection Agency Act (ICAA), as well as arguing other class actions before the Illinois Supreme Court. We are prepared to draw on an arsenal of unique strategies and tactics to help defeat BIPA class certifications at the outset—aimed at cutting off class actions quickly and expeditiously. When a case does move forward, we employ an active motion practice that can halt plaintiffs’ momentum. At every step, we draw on our extensive courtroom and negotiating experience to provide unparalleled BIPA representation before regulators, attorney generals, judges and juries. Hinshaw's multi-disciplined BIPA team is comprised of lawyers who understand biometric technology and have experience in specific areas of concentration, including employment attorneys who work directly with clients to develop risk management and compliance strategies. We will ensure that data collection and use provisions are in compliance in order to prevent exposure and establish processes and standards that minimize BIPA-related risk. 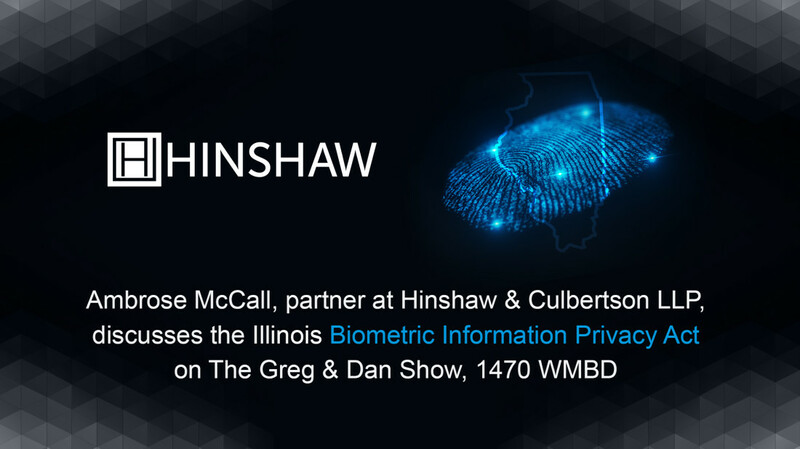 Hinshaw is poised and ready to help companies doing business in Illinois, whether you are faced with litigation or are taking steps to ensure compliance with the Biometric Information Privacy Act. Listen in as Hinshaw's Ambrose McCall discusses Rosenbach v. Six Flags Entertainment Corp. and the Illinois Biometric Information Privacy Act (BIPA) on The Greg & Dan Show, 1470 WMBD.